The Hocking Valley Scenic Railway has been providing rides to the public since 1972. The train, which is operated solely by volunteers, offers rides on Saturday and Sunday, with special daily rides during the month of October, allowing passengers to enjoy the fall foliage. Several tours are offered throughout the year, including specialty tours such as a Robbery Train, Santa Train and a New Year’s Eve Train that offers a pizza party for families and a Wine & Cheese car for those over 21. During a recent visit with my husband, I selected the longest, East Logan train ride abroad the HVSR. 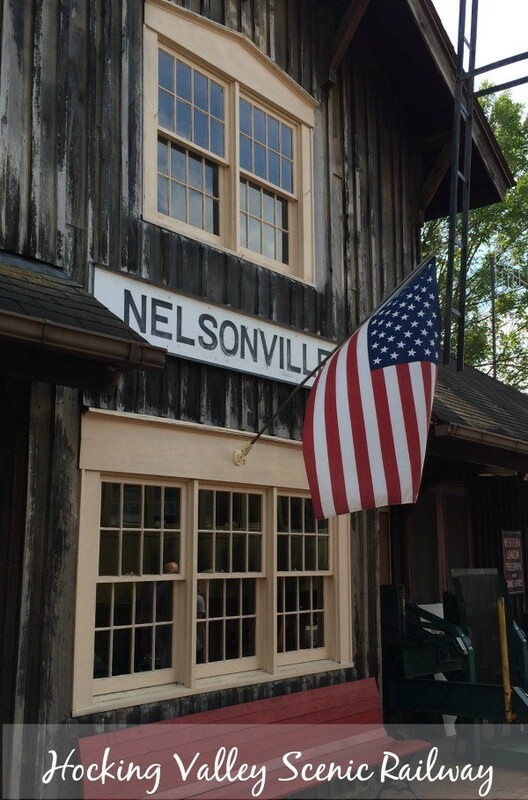 The ride lasts just over two hours, departing from the Nelsonville Depot. 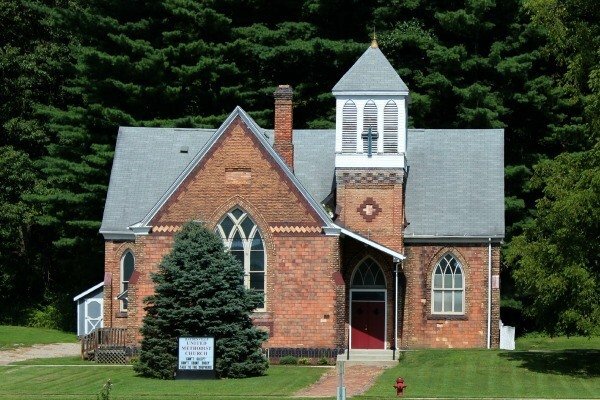 It makes its way through several once booming towns that thrived during the coal mining and brick making eras, before returning past the station to stop at Robbins Crossing, an outreach of Hocking Hills College. 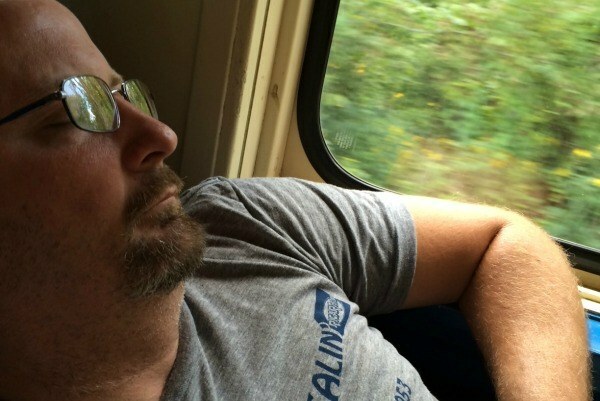 My husband was concerned that the train ride would bore him, but instead, we found it fascinating. I should say I found it more fascinating than he did. He found it hard to stay awake in the comfortable air conditioned car that gently rocked back and forth on the tracks. I thought it was cute- after all, he did hope for a relaxing trip, and that’s exactly what he discovered. 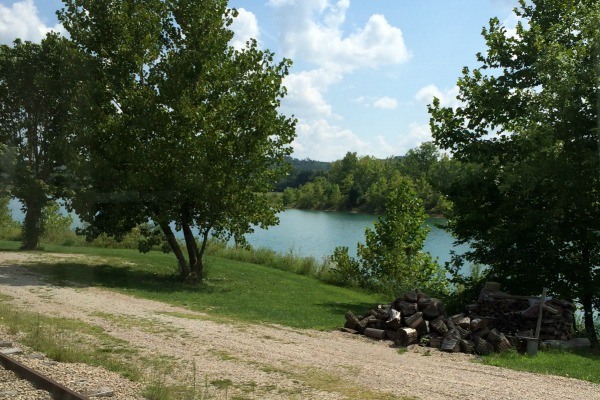 I’d heard of Nelsonville for years from my late grandmother who had grown up in Ohio’s Appalachia region. Her father, who I never met, had worked in the coal mines, which she frequently spoke of. It was interesting to hear the narrator on the train share the history of the area and as I gazed out the window, I imagined what it would have been like for my grandmother to grow up in the gentle rolling hills of southeastern Ohio during the 1930’s. I sat back, took in the view and soaked up my history lesson for the day. 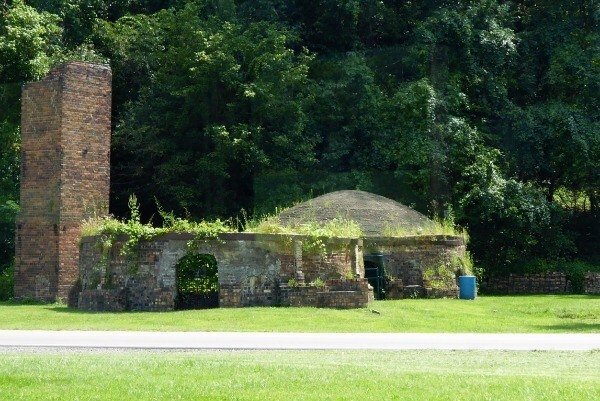 The train passed the ruins of this brick kiln, part of the old Nelsonville Brick Company, which operated from about 1890 to the late 1930’s. The brick company was recognized around the world after taking first prize in the World’s Fair in St. Louis in 1904 for the Nelsonville Brick. The popular paver brick was used to build sidewalks, roads and buildings until its decline at the start of WWI. It was slowly replaced by concrete and asphalt. Today, you’ll find the ruins of the factory along Highway 278. Further down the tracks, the train passes through East Clayton before rolling through Haydenville. The town of Haydenville is unique for several reasons. It was the last company town in the state of Ohio and boasts 121 structures listed on the National Register of Historic Places. Many of the buildings, which look alike, were built from bricks that were manufactured there. 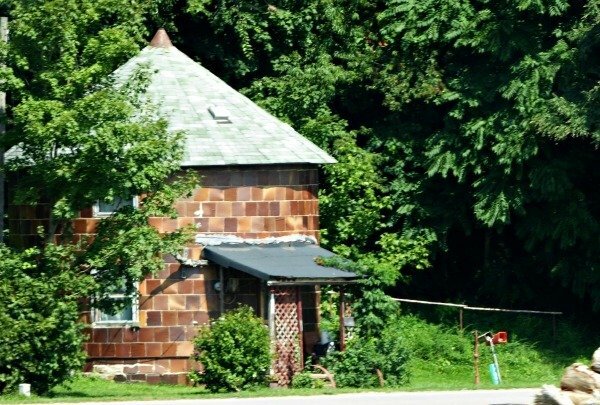 The round house, built to resemble a section of brick pipe, caught my eye. You’ll also hear about the locks that were used for transportion, as well as the Irish and German immigrants who worked sunup to sundown for thirty cents a day and a shot of whiskey to fight off malaria. It’s doubtful that the whiskey fought off anything other than ill tempers. The train returns to the the Nelsonville Depot and makes a brief stop at Robbins Crossing, a small 1850’s era, pioneer village operated by Hocking College. 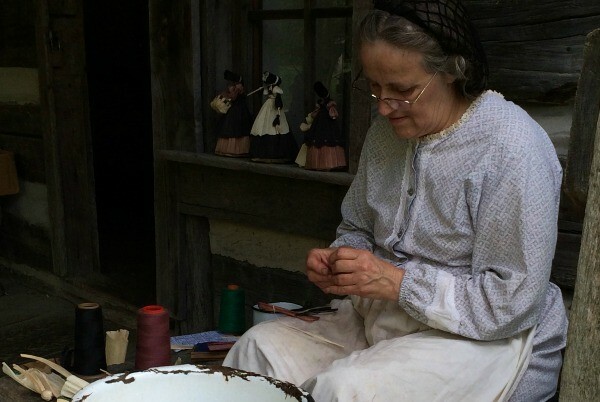 The wood buildings are manned by costumed artisans who act as blacksmiths and other craftspeople. There was also a nature demonstration on the day we stopped with a snake talk, which enthralled the younger guests who were all eager to pet or hold the snakes. 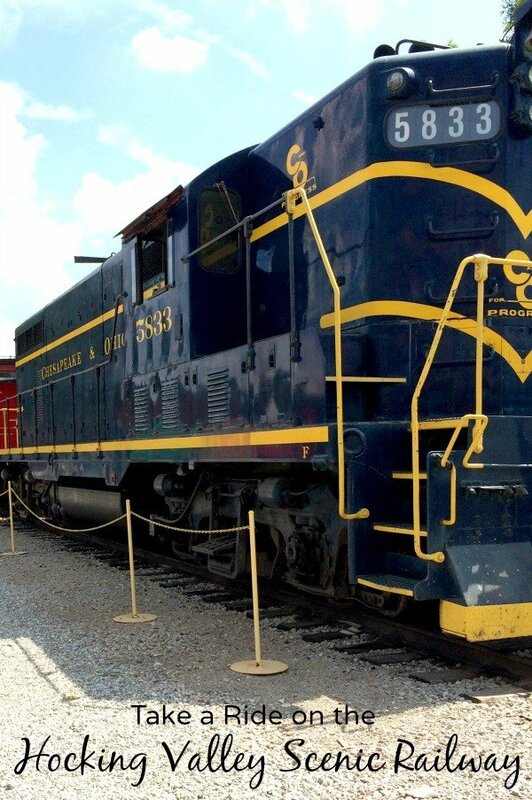 The train follows the Hocking River between Nelsonville and Logan, once part of the Athens Branch on the original Hocking Valley Railway, before it merged with the Chesapeake & Ohio Railway in 1930. In its prime, the railway spanned from Toledo to Athens to Pomeroy. In 1985, C & O sold off some of its less-used track which was then purchased to become the Hocking Valley Scenic Railway. The diesel-powered train, which can reach speeds of up to 65 miles per hour, transports visitor’s abroad vintage equipment at a leisurely 20 mph. Guests may choose their seats amid a 1920’s commuter coach, open air cars, a 1930’s era air conditioned B & O coach and on occasion, in a 1970’s bi-level car. 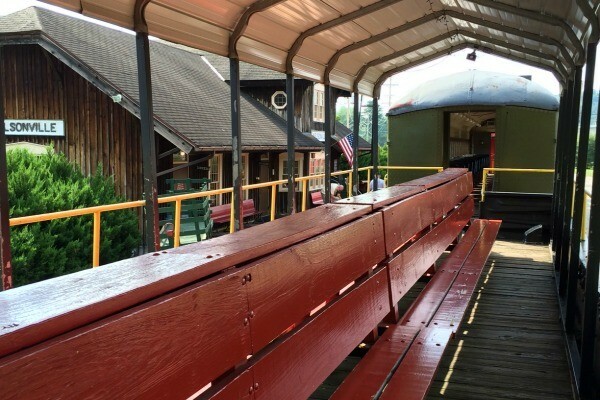 In addition to the train rides, The Hocking Valley Scenic Railway also restores and maintains a collection of train cars which are stored on site. Passengers may buy souvenirs at The Train Shop, located near the parking lot off Route 33 before crossing the tracks to the Nelsonville Depot. Parking: Free parking is available in three different lots near the depot. Cost: Depends on the train ride that you select. Prices for adults start at $13. 1. Tickets may be purchased online, in advance. This may be especially helpful for those specialty trains or busy time of the year (think fall). 2. Free parking is available. 3. Drinks and food are not sold on the train for regular tours, but are welcome. You may want to pack something to drink and a snack. 4. There is no assigned seating so make sure you arrive a bit early to claim a seat on the car that you hope to ride on. 5. The train is enjoyed by couples, families and seniors. Those with mobility issues should be aware that they will need to climb a couple steps to get on and off the train. A wheelchair lift is available for those who are wheelchair bound, please arrive 30 minutes early. 6. The open air train does have a covered roof, but the sides are open and can let in quite a bit of sun. You may want to apply sunscreen before the ride begins. 7. Discounts are available for groups of 40 or more. 8. The train stops at Robbins Crossing, but you are not required to get off the train if you’re not interested. 9. Restrooms are available in the Depot, but not on the train, make sure you go before you board the train. 10. If you’re traveling with children, they may enjoy the view best on the open air cars. If they are very young, you may want to pack a toy or two for them to play with if they get bored. Have you taken an historic train ride? Where did you go? 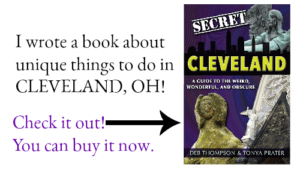 Are you looking for more ideas of things to do in Ohio? 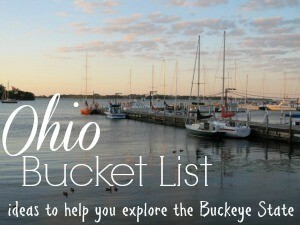 Don’t miss my Ohio Bucket List post. © 2014 – 2016, Tonya Prater. All rights reserved. The kiln looks pretty cool! The trip is probably gorgeous when fall colors are present! I love when you can combine history with modern day! We took a train trip across part of Nebraska because that is what my Grandma wanted to do when she turned 90. I hope that I am still that adventurous someday! I will definitely add this to my list of places to visit. My husband is a rail fan, so I try to squeeze in a train museum or ride on trips when I can. Ohio has several opportunities for train rides. The Cuyahoga Valley National Park also has one that is gorgeous in the fall. If you are able to secure a dome seat, you’d get some pretty good photos. I did like that the HVSR offers a bit of narrative on their ride- not so much that you tune it out, but enough that you get a feel for the area. 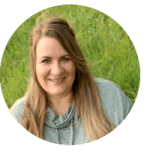 It was great to meet you at Bloggy Con!